Chef Beverly Kim smiles and greets people as they enter her restaurant Parachute. It's a little like the way she would greet people entering her home which is in fact across the road, where she will dash over during service to check on her 8 and 1.5 year old kids. 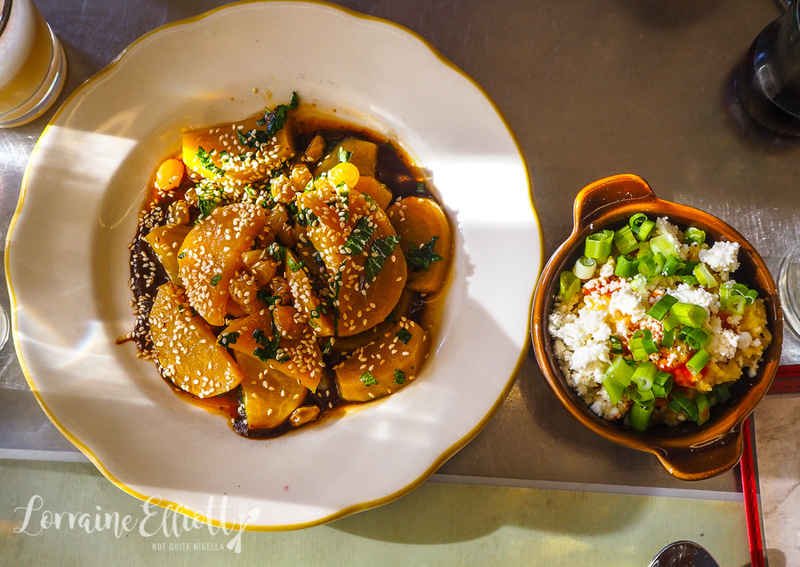 It's a balancing act in her Michelin starred restaurant while her husband also a chef Johnny Clark churns out delicious American Korean food. "It's really American food," says Beverly although the two met over their mutual love of Korean food. 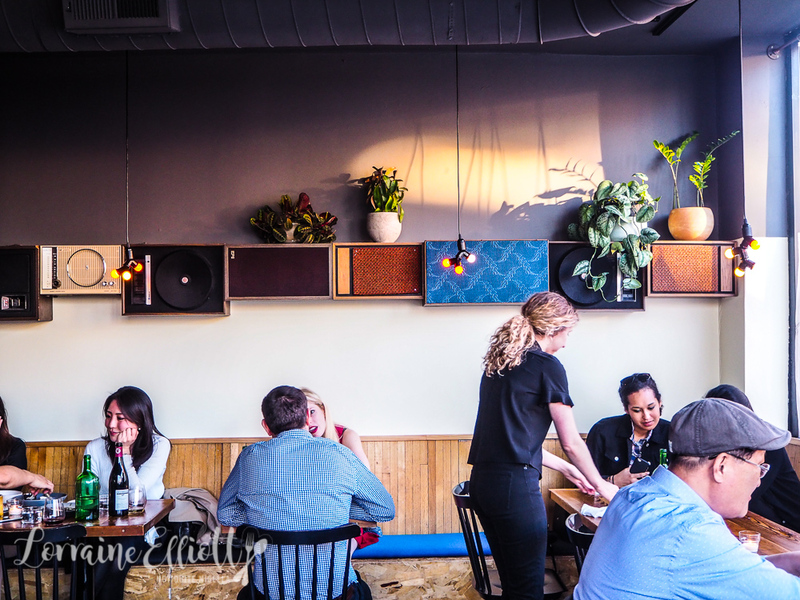 The restaurant is cosy, buzzy and slightly hipster with walls lined with a collection of speakers. The two didn't expect to make such a splash but within a year of their opening in 2014 they were awarded one Michelin star. And yet prices at Parachute are astoundingly reasonable. 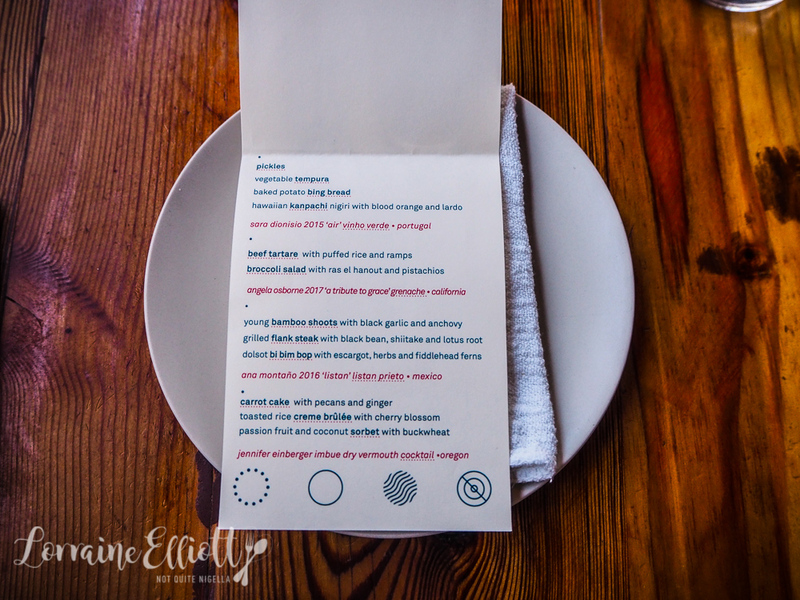 The Parachute tasting menu is $60USD per person with a $40USD per person matching wine menu. Service is wonderful and accommodating and when we ask about the wine our waitress furnishes a detailed print out (oh America, you are so extra!). And the wine menu is themed "Women in wine" with four female wine makers from all over the globe. 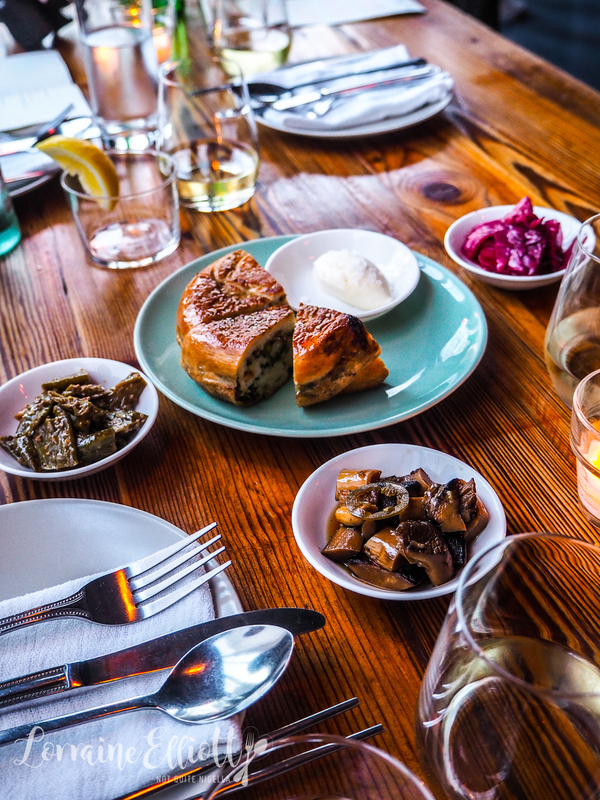 The first plates to hit are served with a glass of 2015 "Air" Vinho Verde from Portugal by wine maker Sara Dionisio. My first food mouthful is colourful and actually my favourite of the night. 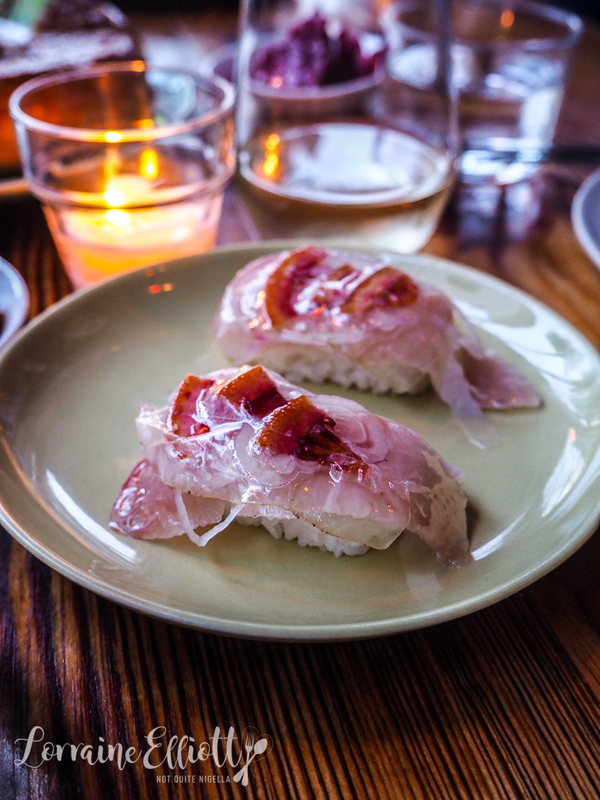 The Hawaiian kanpachi nigiri with tiny blood orange segments draped with lardo are perfection. You pick up the surprisingly large morsels with your hand and savour the melting of the lardo and the sweet tang of the blood orange. The baked potato bing bread is puffy and soft - bing being a Chinese word for bread. 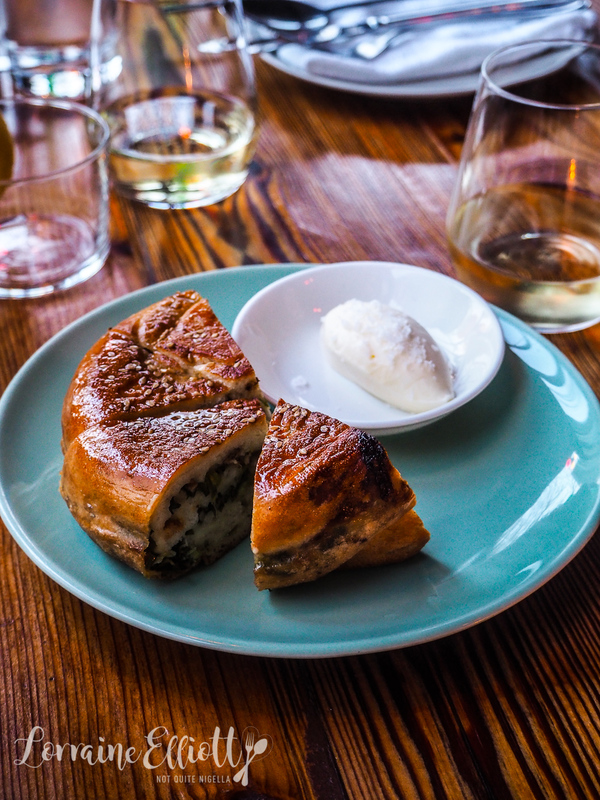 It's filled with potato and spring onion and is like a spring onion pancake but in a bread roll version served with sour cream butter. It has also been brushed with bacon fat for extra flavour. It's like a hug but better. 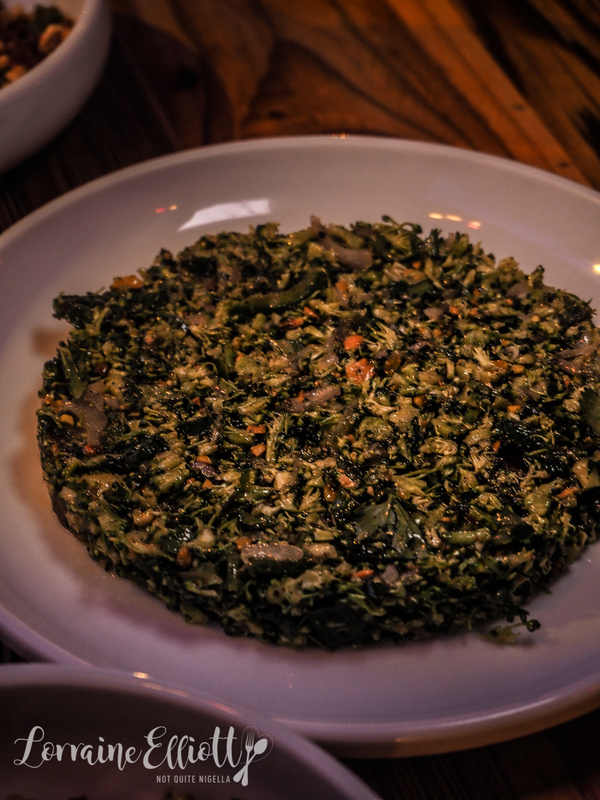 There is also the customary banchan with sesame shisito peppers, jalapeno mushrooms and a kim chi made of red cabbage. All of these add heat, aroma and pungency when you need it. 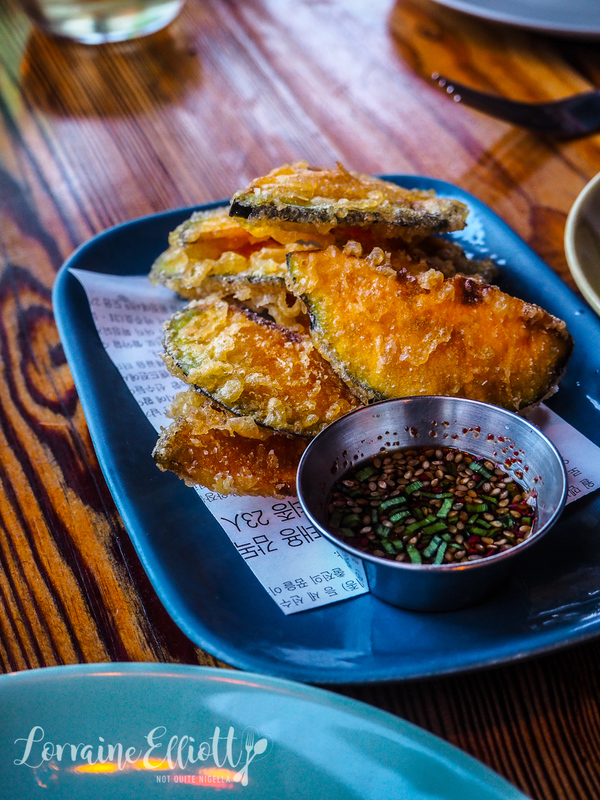 This paper thin kabocha squash tempura is so crispy perfect it's a little like a chip encased in tempura batter. Then comes the middle section of courses paired with a 2017 "A tribute to Grace" Grenache from California by New Zealand born wine maker Angela Osborne and is named after her grandmother and her favourite attribute, grace. 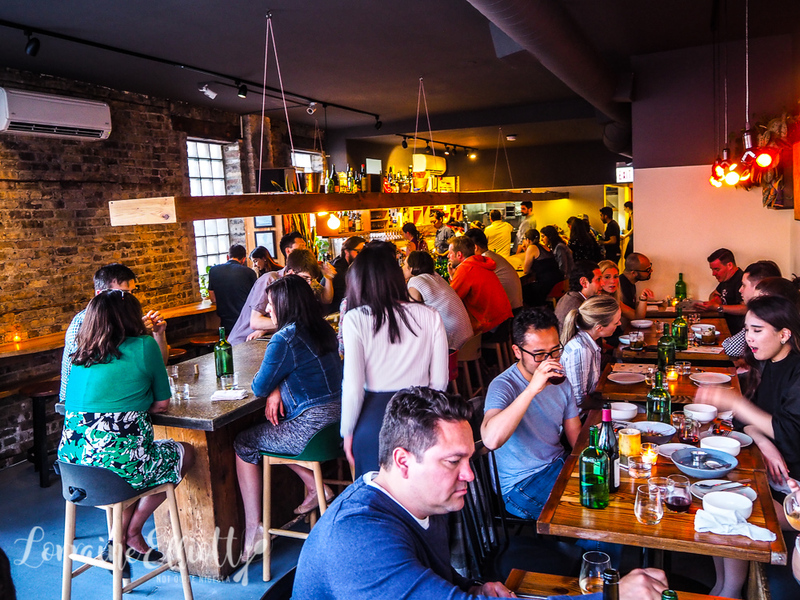 Dishes are well paced so you're never left wanting or wondering. The beef tartare with puffed rice and ramps is the sort of thing you eat with your fork or spoon because Korean chopsticks don't pick up enough. 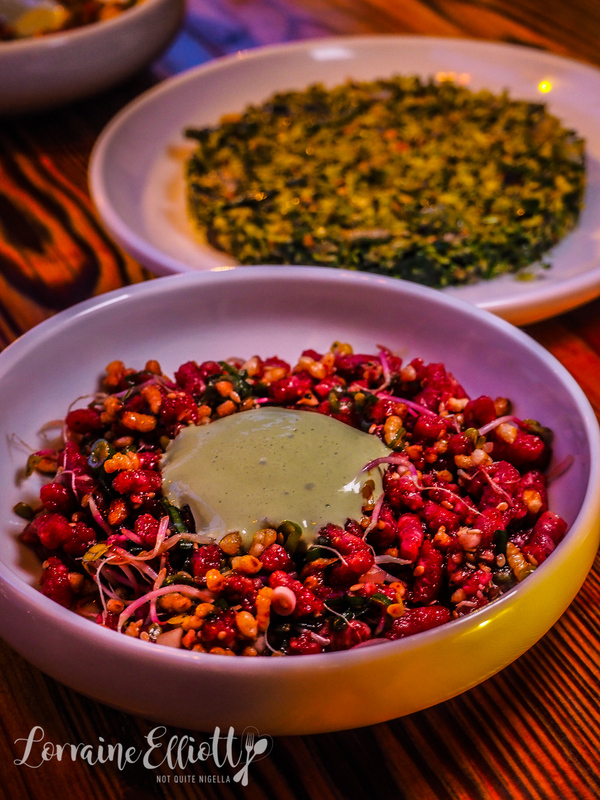 Same with the broccoli salad that is powerful in flavour with ras el hanout, pistachios, dates, coriander and chilli. The salad and the tartare go well together. The heavier main courses are next and they're served with a 2016 "Listan" Prieto from Mexico by wine maker Ana Monatano using mainly mission grapes. 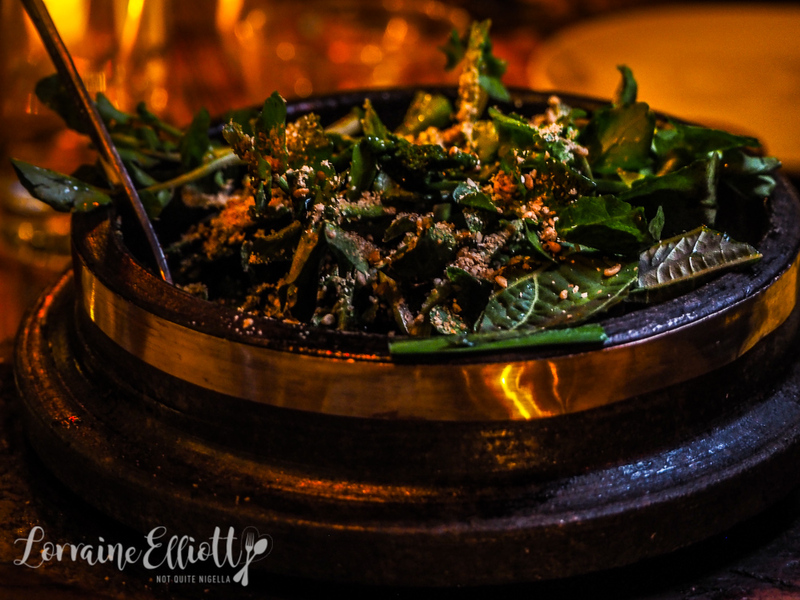 The bibimbap is given a twist with plump, tender escargot, herbs and fiddlehead ferns and crispy rice at the base. 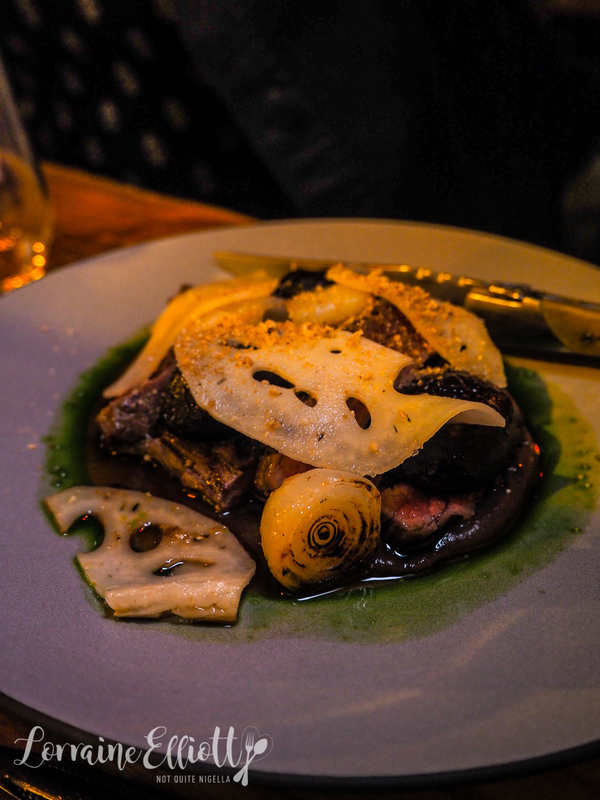 The grilled flank steak is paired with black bean, shiitake and sweet pickled lotus root and has a creamy, sweet sauce at the base that makes you want to come back for seconds and thirds. The steak is perfectly pink in the centre and has a great beefy flavour to it enhanced by the umami black bean and shiitake accompaniments. The young bamboo shoots I could take or leave. I think by now I was more eating for sheer gluttony rather than hunger (what's new) and they're paired with sweet black garlic and anchovy so they're very strongly flavoured. There are three desserts and you definitely want to leave room for these. The drink served with them is made with a Imbue dry vermouth cocktail from Oregon by Jennifer Einberger mixed with cerasum cherry and sakura blossom liqueur and Clement Creole (orange rum liqueur) shrub. 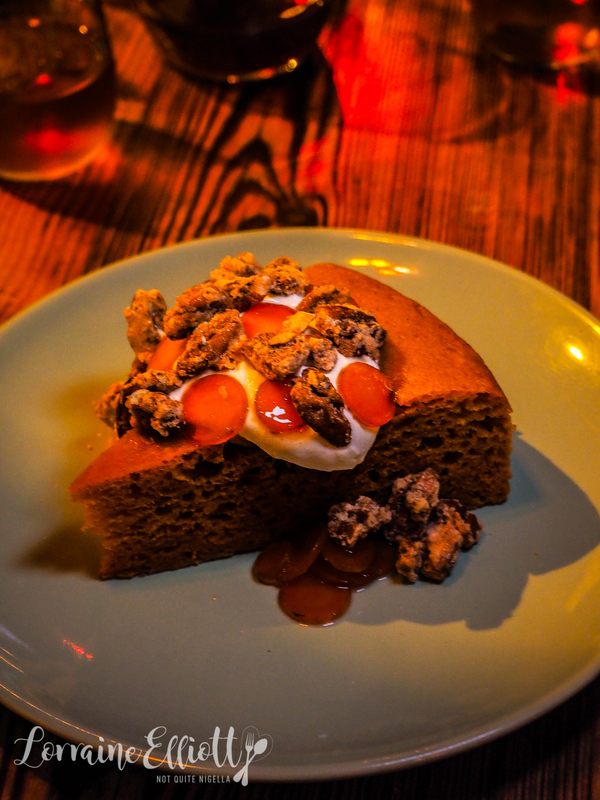 The slice of steamed carrot cake comes with sugar and egg white rolled pecans, ginger with unsweetened cream topped with candied carrots. It's not overly sweet like a lot of desserts tend to be here and is an exercise in delightful restraint. The toasted rice creme brulee with cherry blossoms is moreish and a great idea that I'll be trying to recreate at home. 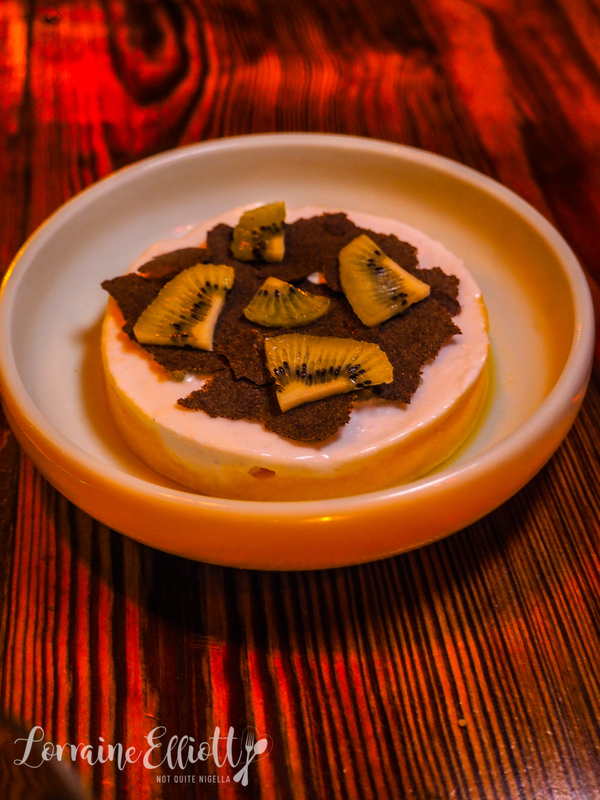 And for those that like things at the end to be refreshing, the passionfruit and coconut sorbet with thin buckwheat crackers and kiwi fruit is the ideal level of pucker and tart. You'd think that most people would probably be done with food for the night. But they wouldn't be me and when Anna mentioned honey butter fried chicken was about 5 minutes walk away we soon found ourselves rushing and trying to get there before they closed at 10pm. 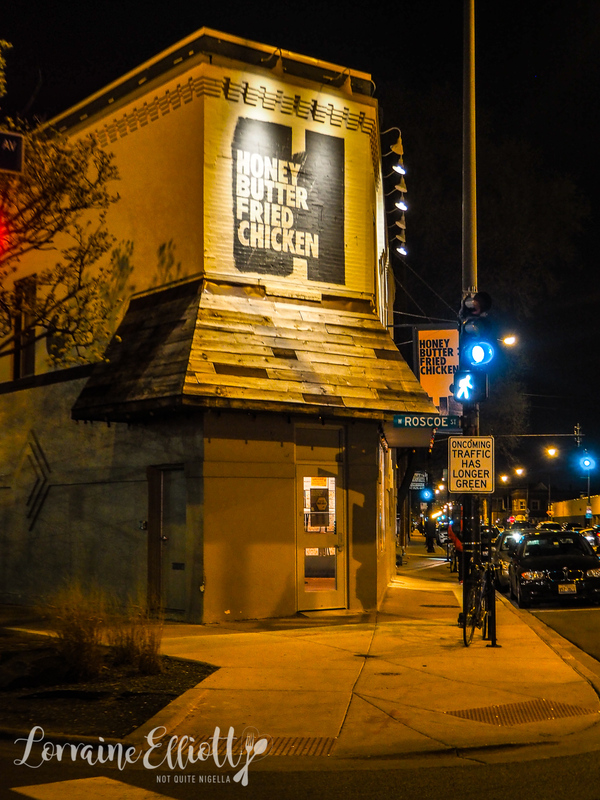 Honey Butter Fried Chicken is a Chicago based success story. Crispy, super, super moist chicken fillets are served with the most wonderful sauce of honey butter. 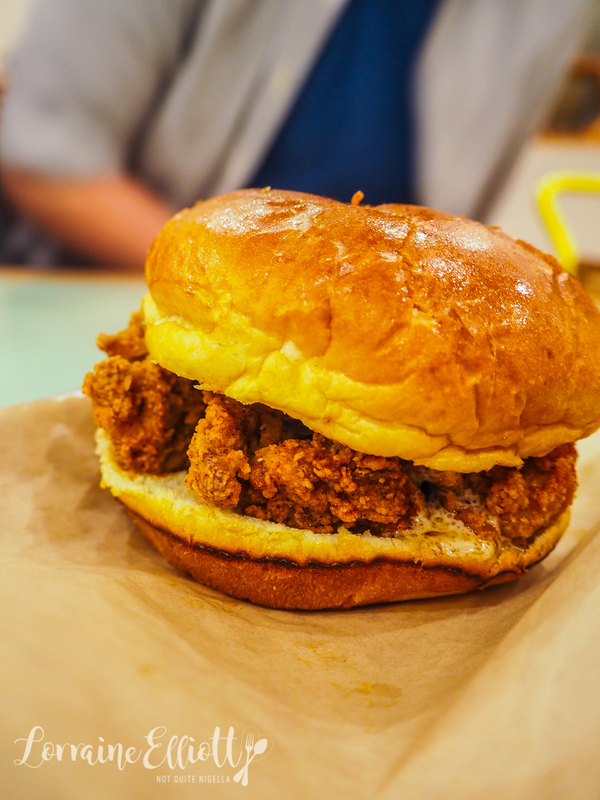 Get it in a sandwich for some extra honey butter lovin' as the sweet butter soaks into the soft white bun creating the tastiest, most heavenly bed for the chicken fillet. And this burger is a salad free zone too (need I point that out? ;)). 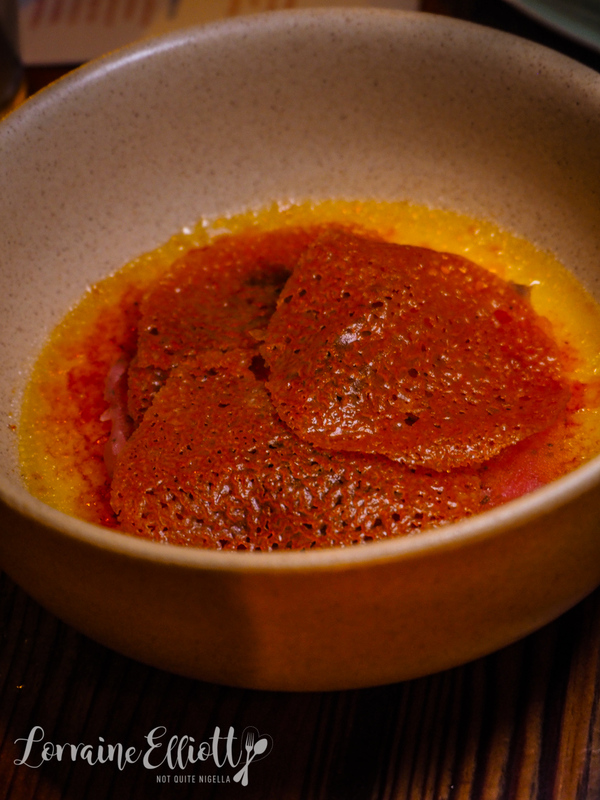 The secret is antibiotic and cage free chicken that has been humanely raised, a brining process to ensure the chicken stays moist and a bit of Spanish pimento. And I wish someone would bring this out to Australia. 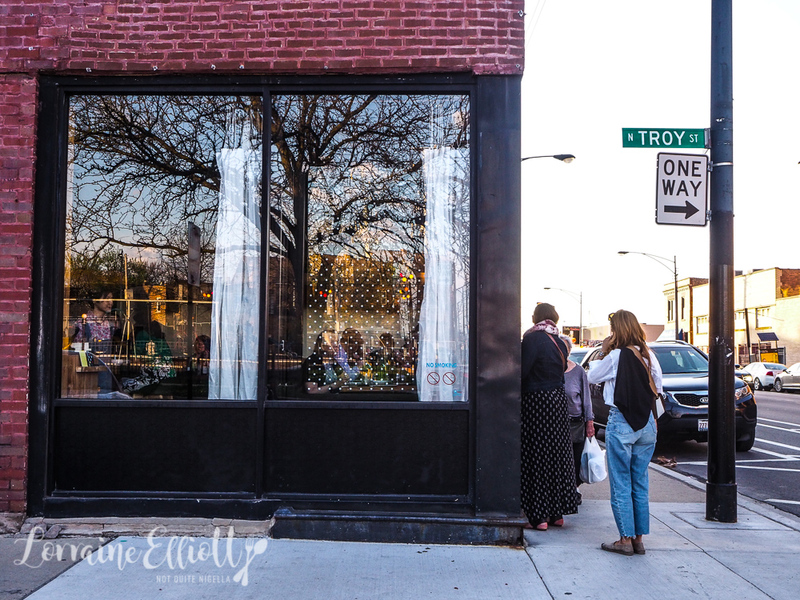 If you head towards Wicker Park (10 minutes by car) you'll end up in a gorgeous hipster area with great boutiques and restaurants. 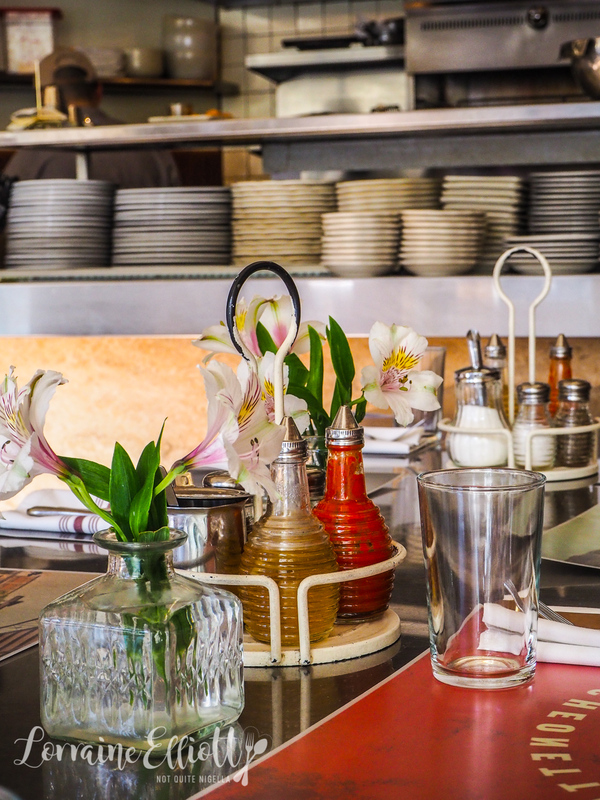 This is where I found my favourite Tex Mex or Southern style Mexican food all served in an adorable diner setting at Dove's Luncheonette. And if you're in the mood for tequila Dove's has a large tequila menu and the option to do a mezcal or tequila flight. I meet my Chicago based blogging buddy Mila. 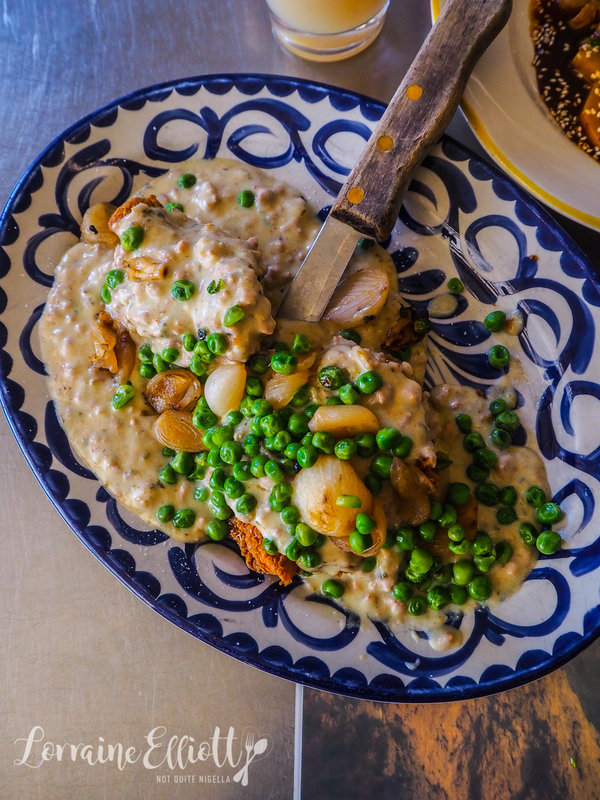 The Chicken Fried Chicken is like a chicken schnitzel but given a Southern twist as it is smothered in a creamy chorizo verde gravy and topped with peas and pearl onions. The chicken is beautifully moist inside the breading. I had an absolute hankering for salad-I eat salad every day and I've been missing my fresh, healthy crunch so we order two salads. I was also curious to see a Tex Mex salad. 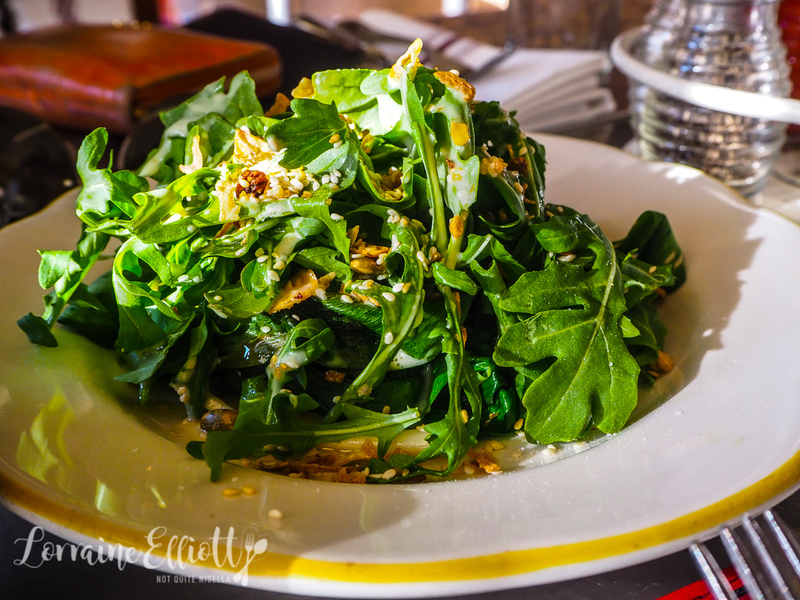 I didn't realise how much I missed avocado until I fell upon this avocado salad with rocket/arugula and charred ramps (similar to a spring onion) with a sunflower oil vinaigrette and crispy fried onions. It's so good and I find myself going back for more and more of this. 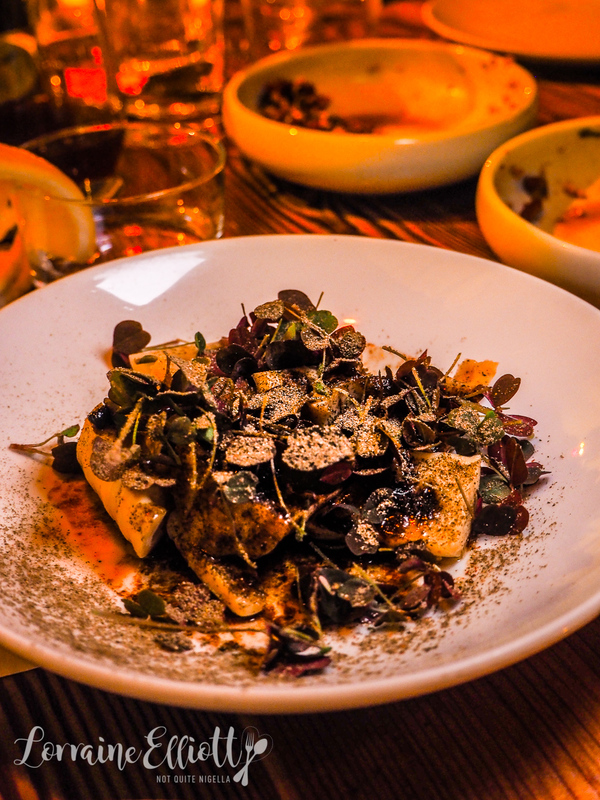 The betabeles is a sliced golden beetroot salad where the beetroots are roasted but served chilled on a bed of poblano mole with plump, pickled golden raisins, mint and sesame seeds. It's such a gorgeous salad that I am rather smitten with the earthiness of the mole paired with the sweet beetroot and raisins. Illinois grits are ones that have been grown in Illinois. These are served with crumbled feta cheese and hot sauce and they're pretty damn moreish and go well with the chicken fried chicken. 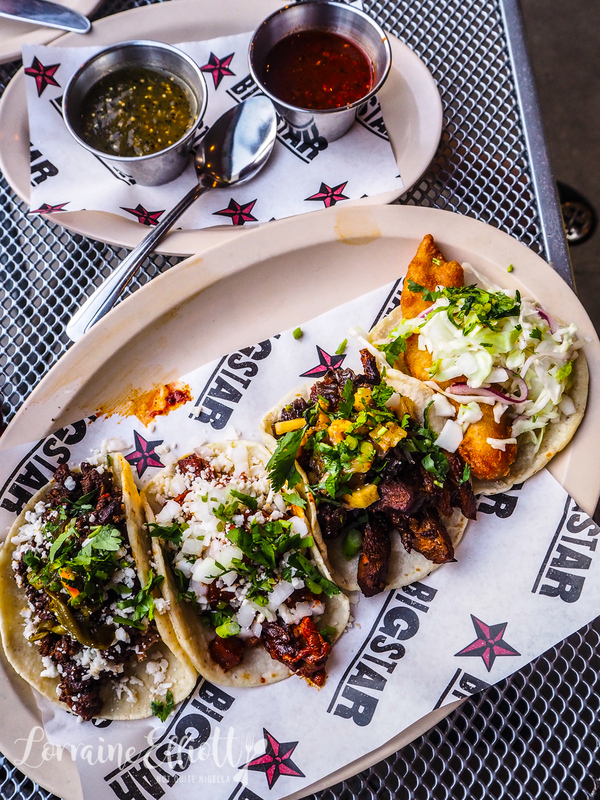 And if you head next door and follow the crowd, there's Big Star tacos, an extremely popular taco place with locations in Wicker Park and Wrigleyville. 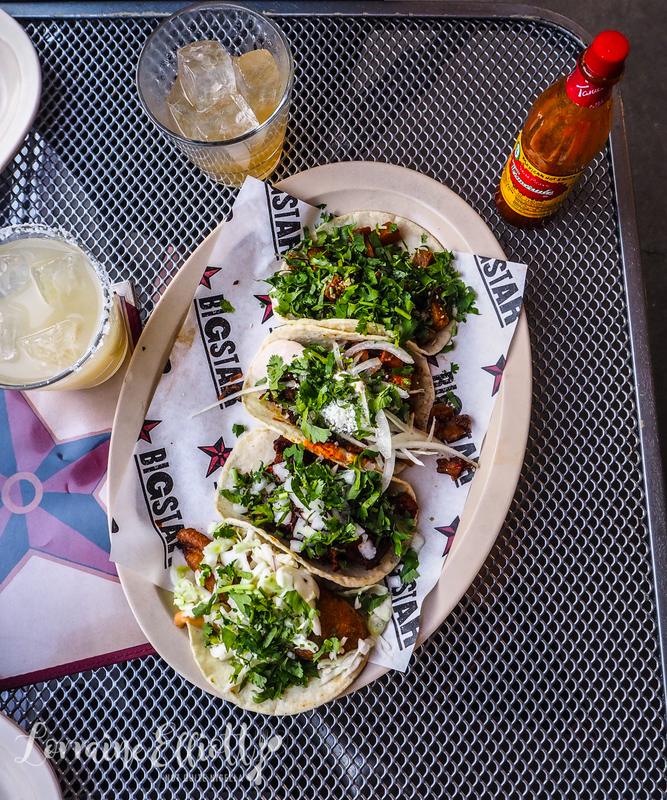 Mila and I try a range of their tacos and I order a spicy tequila margarita. I read that the vegetarian tacos were the pick over the meat ones so we tried three vegetarian ones as well as the Taco de Pescado or fish taco ($4USD). The fish used is a tilapia which isn't the best fish but the battered fish is nicely crunchy and I like it when combined with the extra serve of crema ($1USD). The vegetarian ones that we tried were the Taco de Zanahoras $2.50USD (mole spiced carrots, chipotle date yogurt, pumpkin, sesame seeds, coriander and almonds), the Taco de papas con Rajas $2.50USD (potatoes, rajas chipotle, queso cotija, onion and coriander) and the Taco de Yuba Guisado $3.50USD (yuba tofu, guajillo salsa, white onion and coriander) and while they were pleasant and nice, I wouldn't say that they were the highlight. We then try the Taco de Panza $4USD with crispy braised pork belly tomato guajillo sauce, queso fresco, onion and coriander and this is one of my favourites of the lot. The pork belly is served in small cubes and it is sticky sweet. The Taco Carne con Chile Colorado $4USD is braised beef shoulder, red chile sauce, smoked cheddar, vegetable escabeche and coriander and comes in larger chunks which make this a bit harder to eat but still tasty. And the Taco de Chorizo Discada $3USD with bacon, beef and pork chorizo, salsa borracha, pinto beans, poblano and queso fresco is full of strong flavours. 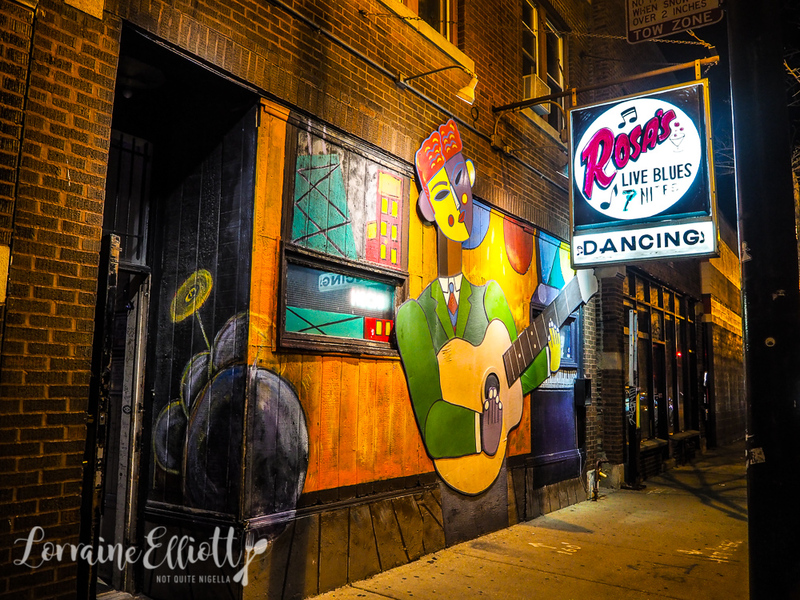 The area West to Wicker Park is Logan Square and it is home to Rosa's Lounge, billed as Chicago's friendliest blues club. 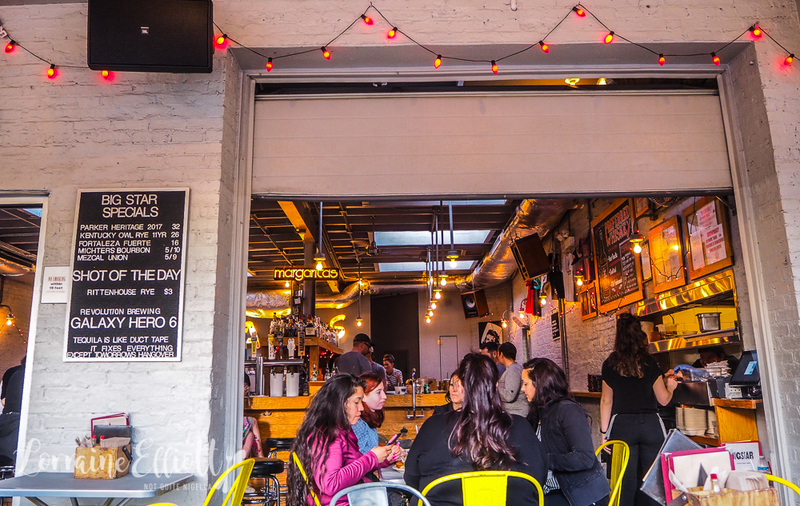 Named after owner and founder Tony Manguillo's mother Rosa whose face adorns a wall, it's a great place to listen to the blues. We listen to Nora Jean Band with Brian Lupo with their "Going Back to Mississippi" show. 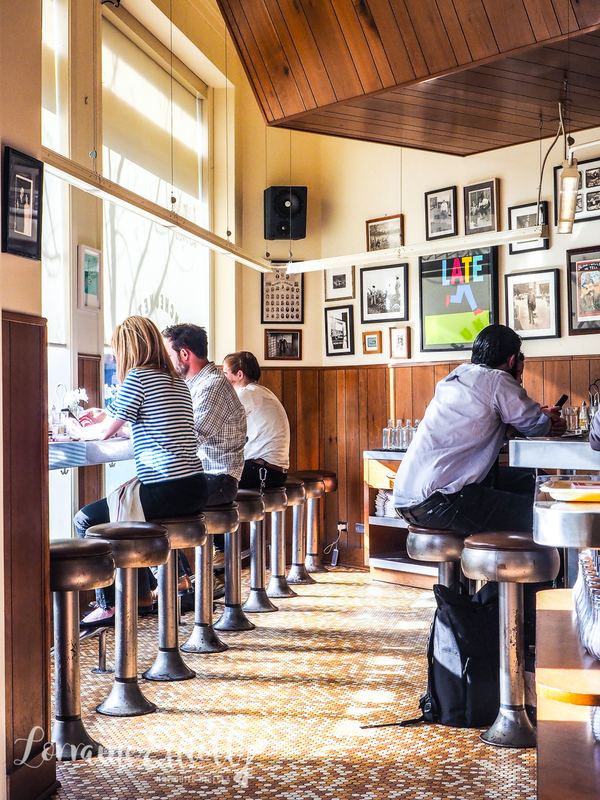 Down the road is Scofflaw, a neighbourhood bar where if you happen to be there at midnight, a round of complimentary freshly baked chocolate chip cookies will come out. That's Midwestern hospitality right there folks and seems like the perfect way to end my Chicago trip. So tell me Dear Reader, do you tend to stay in downtown areas or do you like venturing out when you travel? 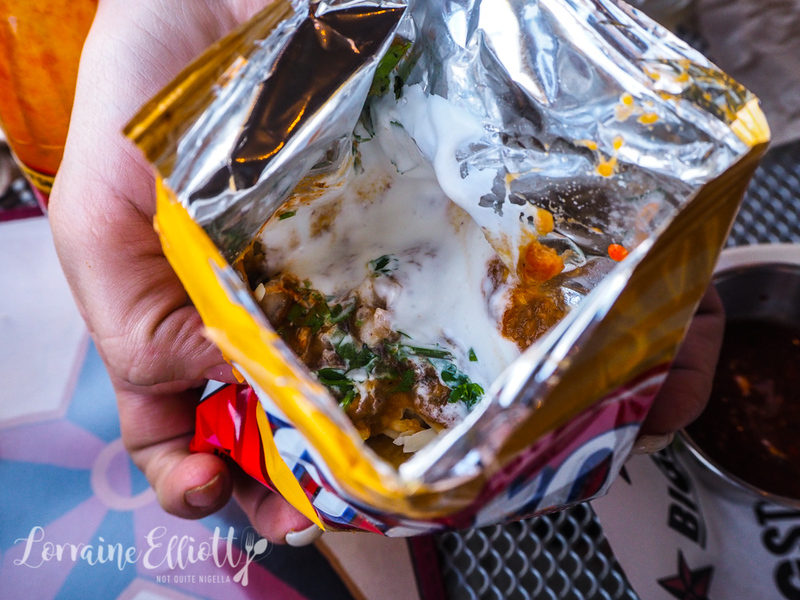 Have you ever had a walking taco? Have you ever tried Honey Buter Chicken! NQN was a guest of Choose Chicago but all opinions remain her own. 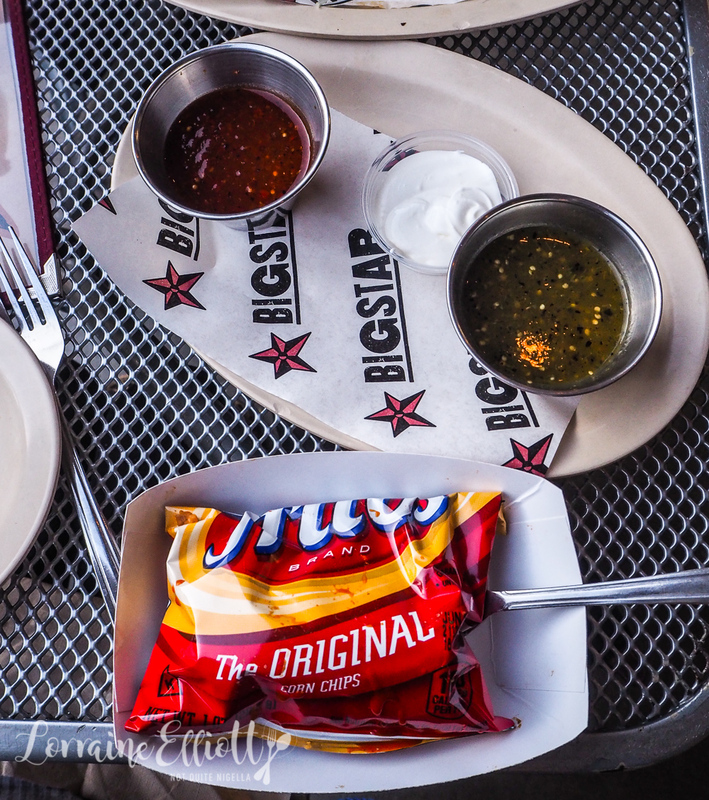 Meals at Dove's Luncheonette and Big Star Tacos were independently paid for.